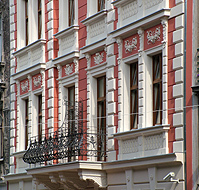 Located in the very heart of the Old Town center, by Garbarska 10 street, hardly 500 m away from the main square, remains distant from the city noise. In elegant and functional rooms, our guests will find ideal conditions for work and relaxation. Comfortably equipped toilets, TV Sat, free of charge and high transmission internet create a place which is pleasant and comfortable for every guest. The hotel is visited by well known people related to culture, arts and politics except for tourists and businessmen. The friendly and professional service as well as unique atmosphere of the interiors combined with monumental architecture of the place make everyone feel like home, wishing to visit us again. The dining services of the hotel are provided by Cynamonowe Bistro restaurant with the choice of Polish and European cuisine. Amber hotel additionally offers conference room fully equipped with audio visual set, internet place in the hall and wide range of various facilities. We guarantee the highest level of services distinguished by prizes awarded. We are acknowledged by the readers ofÂ Â Â www.tripadvisor.com not only as the best Cracow's hotel. We offer our rich and valuable experience all over Poland and we try our best to meet the expectation of our guests.